Chelsea captain Katie Chapman has been recalled to the England squad for next month's inaugural SheBelieves Cup in the United States. The 33-year-old midfielder has not been selected since last summer's World Cup, where England finished third. Arsenal defender Alex Scott, 31, also returns after being left out of the last squad. The Lionesses take on Germany, France and the host nation at the tournament, which begins on 3 March. Chelsea forward Eniola Aluko, currently on 98 caps, has the opportunity to reach 100 after her selection. But there is no place for Notts County forwards Jess Clarke and Ellen White or defender Amy Turner. Manchester City and Chelsea both have seven players in the squad. 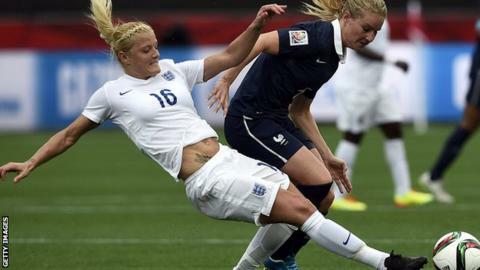 England's three matches at the SheBelieves Cup will be broadcast live on the BBC.